"What mighty contests rise from trivial things." When a contributor doesn't see eye to eye with a current entry, they will usually make some sort of change to correct it as they feel it needs to be. However, other posters may feel that the change is wrong, and restore the earlier version or write yet another new one. If those involved are sufficiently incensed over an issue, this may lead to a cycle of posts, cancellations, counter-cancellations, re-posts, etc. 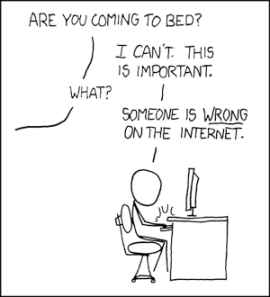 In extreme cases, it may lead to Flame Wars, Thread Mode posting, or even retaliatory Wiki Vandalism. If these problems become too unmanageable, it may be necessary to lock the page. Many wikis have policies about repeated cancels and reposts to try and disarm such conflicts, but sufficiently angry posters often have ways of getting around such controls. The Sock Puppet is a common tool. Some wikis also tend to have their own rules depending on the types of editors that run them, so one rule that applies to This Very Wiki may not apply as much to another and so forth. Here, we have a strict policy about edit wars. If you add something, someone changes or removes it, and you change it back, you're edit warring. If someone changes something, you revert it, and they change it again, they are edit warring. The third edit is the threshold. Edit warring is grounds for suspension for all parties involved, regardless of whether it is intentional or not. The article's Discussion page. If you use this, please leave an edit reason saying so, because most people won't think to look there first. A private message to the troper with whom you are having the disagreement. Needless to say, this works best if there's only one other person involved. Ask The Tropers. This is a public venue for general wiki questions. It's better still if you send a PM or leave an edit reason asking the other troper(s) to come there with you. The forums, such as Trope Talk (for trope disagreements) or Wiki Talk (for other articles). If someone is repeatedly vandalizing an article or is not responding to your attempts to engage them, use the "Report Page" button in the sidebar to send a message directly to the staff, or post in Ask The Tropers. Do not make the mistake of thinking that leaving an edit reason is sufficient discussion. That's just painting over the fact that you are using the wiki to conduct your argument. Of course, if you do use it, please keep it civil. Being rude will earn you a ban. Exception: We generally recognize exceptions to the edit warring policy in cases where the editor is making an article compliant with wiki policies (such as removing a YMMV example from a primary article or correcting formatting). That said, if someone is edit warring already, continually reverting their work won't help even if it's correct. Get the moderators to deal with the situation instead of fighting a pointless battle. Not to be confused with the Great Text Editor Wars .